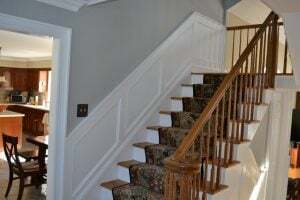 Portions of southern Morris County have been serviced by Monk’s Home Improvements since 2007. We are excited to have branched north to Boonton and Denville in 2015. Since you may not know much about us, we should tell you that we take pride in delivering a painting or carpentry job that you’ll enjoy for years to come. In fact, we guarantee it. We use only the highest quality paints and materials to ensure your project lasts. Ryan Finn manages all of the Monk’s Home Improvements projects for Boonton NJ and Denville NJ. Ryan’s background is in appraisal and home inspection. At Monk’s, his job is to ensure your complete satisfaction. Ryan lives with his wife and adorable daughter. Ryan looks forward to discussing your interior painting or exterior painting project with you. Call to schedule an appointment for a free, written, on-the-spot estimate with Ryan Finn. He’ll tell you why we are the best painters in Boonton NJ! Our Exterior Painting Project is the Longest Lasting in the Business. Read about the “Monk Family Recipe” for Exterior Painting and see why our process leads to a better painting result. From simple repairs, to new decks, built-ins and custom closets, Monk’s carpenters can take care of any of your carpentry needs. Our experienced crews will work every day to complete your job. If you require painting, our Painting crews will arrive immediately afterwards to complete the project. We coordinate everything. You get expert teams and a shortened timeline. Call 973-635-7900 today to schedule an appointment with Ryan to discuss your painting or carpentry needs.